Rohan Tungate top-scored for Panthers. Team manager Carl Johnson took the positives from a second successive Peterborough Panthers defeat last night (April 10). The city club’s first away test of their new top-flight era ended in a 50-40 defeat against Belle Vue at the National Speedway Stadium. Panthers’ loss in Manchester came nine days after they were shrugged aside 48-42 by the same opponents in their 2019 curtain-raiser at Alwalton. They provided a third of the race-winners and took three heat advantages on a night when they were always behind but remained in contention throughout. Former Belle Vue man Rohan Tungate top-scored with nine points from the number one berth, while middle-order pair Bradley Wilson-Dean and Charles Wright contributed 8+2 apiece. A hat-trick of second places were bookended by two lasts for captain Hans Andersen while short-term signing Aaron Summers collected five points from his three outings at reserve. Fellow bottom-end man Ben Barker could only manage 2+1 while Lasse Bjerre’s tough start to the season continued due to more mechanical issues. 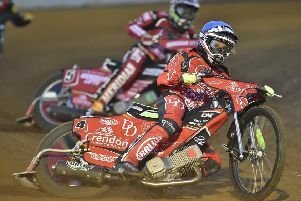 The Danish rider, who drew a blank in the reverse fixture nine days earlier, retired from his opening two outings and managed only two points from a second place in heat eight. Johnson said: “We can take confidence from the fact we managed to put 40 points on the board at a very tough track to the visit. “It’s disappointing to come away with a 10-point defeat, but we pushed Belle Vue hard for the vast majority of the night. “There are still some bike issues that need to be ironed out quickly, but we are getting there slowly but surely. “We’re probably only one rider away from having won both meetings against Belle Vue. Panthers are back in action tonight (April 11) when hoping to make it third time lucky in 2019. They entertain Wolverhampton in another SGB Premiership Supporters’ Cup clash at the East of England Arena, 7.30pm. Johnson added: “We need to get a win on the board and hopefully tonight is the night it will happen. “We can take plenty of encouragement from both meetings against a strong Belle Vue side and now we need everyone on form from heat one to heat 15. Panthers’ trip to Wolverhampton on Monday (May 8) was abandoned after only two races due to heavy rain. That clash has not yet been rescheduled. BELLE VUE: Max Fricke 14, Dan Bewley 11, Kenneth Bjerre 10+1, Steve Worrall 8+2, Jaimon Lidsey 4+1, Ricky Wells 2+1, Dimitri Berge 1. PANTHERS: Rohan Tungate 9, Bradley Wilson-Dean 8+2, Charles Wright 8+2, Hans Andersen 6, Aaron Summers 5, Ben Barker 2+1, Lasse Bjerre 2.